Protects your eyes from dust, pollution, and dirt and keeps them feeling fresh and clear. This eye drop also provides relief to fatigue eyes and from burning and itching. PACK SIZE: 5 ml . 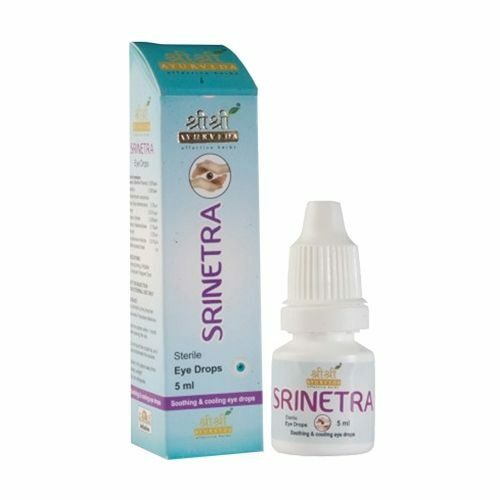 Sri Sri Ayurveda Srinetra Eye Drops is made up of effective herbs. This help protect your eyes from dust, pollution and dirt and keeps them feeling fresh and clear. This also provides relief to fatigued eyes , burning and itching eye problems. Ayurvedic herbs, Srinetra eye drops take cares for your eyes and keeps them healthy ,clean and bright. This is made up of various ingredients : Menthol leaf crystal, Karpura crystals,Rose Petal Liq Extract, Honey, Sodium Chloride, Sodium metabisulphate, Glycerin, Benzalkonium Chloride, Sterile aqueous base. USES: This is used to protect the eye from pollution and dust, relief to fatigued eyes, from burning and itching. This is indicated in Burning , Itching , Irritable & computer Fatigued Eyes. Store in dry place away from direct sunlight. Use the solution of eye drops within one month after opening the vial. Do not touch the nozzle tip, as it may contaminate the solution.